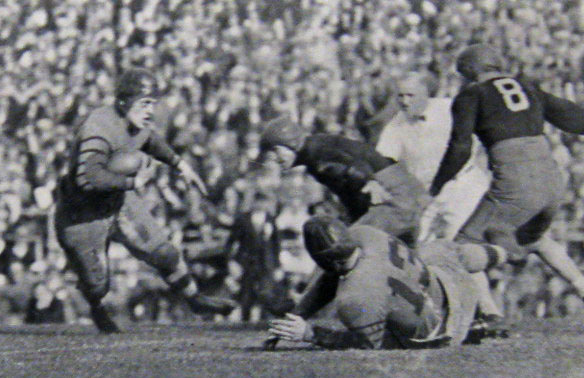 Wilson carries the ball against Alabama in the 1926 Rose Bowl. George "Wildcat" Wilson was the University of Washington's all-everything player in the early 1920s. His stellar play lifted the Huskies to prominence in the Pacific Coast Conference. During his three years with Washington the Huskies won 28 games, lost three, were tied thrice, and went to the Rose Bowl in 1925 and 1926. He also set the school's record for career touchdowns at 37 which still stands (it was tied by Joe Steele in the late 1970s). Wilson was a 60-minute player and handled the ball almost every play when on offense. With it in hand the 5' 11", 185 lb. speedster was a triple threat as he was able to rush, pass or kick with equal skill. Moreover he used the stiff-arm with disturbing effectiveness when he chose to run. He was also considered a formidable linebacker. 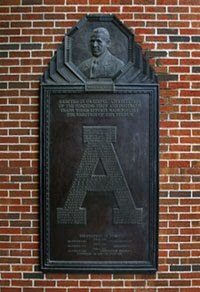 In 1925 he was named to Grantland Rice's All-American squad alongside Red Grange and his team earned an invitation to the Rose Bowl game to face Alabama. Wilson was having a day against the Crimson Tide but was knocked out of the game late in the second quarter and didn't return to play until the final period. With Wilson in the game, Washington gained 317 yards and scored 19 points. With him on the sideline, the Huskies could only garner 17 yards and went scoreless. In that interim, Alabama scored 20 points. That proved to be the difference as the final whistle sounded. Alabama 20 - Washington 19. Wilson was inducted into the College Football Hall of Fame in 1951, named to the All-Time Pacific Coast Team in 1969 and inducted into the Rose Bowl Hall of Fame in 1991.